While many spent Super Bowl Sunday crowded around televisions with pizzas and beers, nearly 70 community members poured into Christian Love Missionary Baptist Church to celebrate Black History Month by commemorating some unsung black heroes. 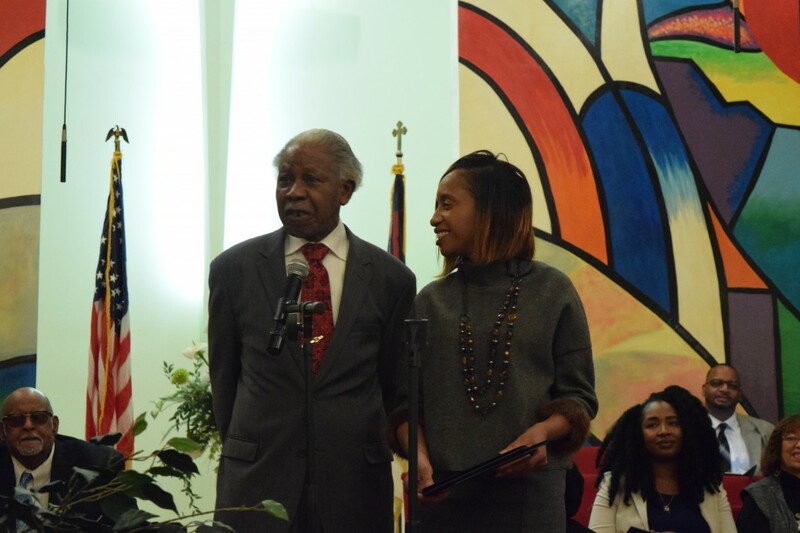 U.S. Rep. Danny K. Davis together with the Sankofa Safe Child Initiative honored 16 community leaders who’ve had a positive impact. The celebration was one of 10 Black History Month events Davis has planned for the month of February. “Part of the reason that we do this is to help people know that oftentimes we are in the company of giants who think they are midgets,” Davis said. Pastor Steve Nelson hosted the event, which included gospel music, prayer and live performances by the Celestial Ministries Drum Line, songstress Black Heaven and spoken word artist Diana Tyler, know by her stage name Goddess Warrior. As much as it was a night of celebration, it was also a night of historical remembrance – and a call to action for the community. The main directive: The community must get more involved in the future of black children. Phillip Jackson, executive director of the Black Star Project and one of the night’s award recipients, expressed his concern over the staggering low 7 percent of black boys who read proficiently in Chicago. He urged audience members to take action to correct the problem. Barbara Cole, another award recipient, also emphasized the importance of supporting black youth. Gus Rickette, owner of Uncle Remus Saucy Fried Chicken, along with his daughter president and CEO Charmaine Rickette also were honored. They spoke on empowering the black community by supporting black-owned businesses. Congressman Davis also commented on his own journey, reflecting on the accomplishments black people have made throughout history. But despite the progress black people have made, there are those who feel Black History Month is unnecessary. In a recent interview with Fox & Friends, actress Stacey Dash said there shouldn’t be a Black History Month because there is no White History Month. Margaret Staurou, a member of Blocks Together and Bickerdike Redevelopment Corp., said statements like Dash’s outrageous and black people deserve a right to show pride. In his closing remarks at Sunday’s event, Davis outlined the long history of black people in America, a history filled with dehumanizations and oppression, but also triumph and accomplishment. After the ceremony, he, like Staurou, shared the importance of keeping Black History Month alive. Pastor Emeritus James Brooks Sr. Congressman Danny Davis and the Sankofa Safe Child Initiative will honor several "heroes" at 3:30 p.m. Feb. 7th at Christian Love M.B. Church, 535 N. Spaulding Ave. The Chicago Police Department's 15th District community policing is sponsoring the event; the deadline to enter is 5 p.m. Feb. 28th.